Cooper Spur and Mt Hood's North Face from Cloud Cap Inn. Try the mouseover to see precise line of the Cooper Spur Route. We drove south toward the north side of Mt Hood to catch a fleeting one-day weather window in which the fenesration wouldn't fly farther north. Plans began simply but culminated with a motley crew. We were two vehicles strong; I drove with Cyril and Corey took Scott and Donnelly. We feasted on Chinese food in Hood River before driving as far as we could toward Tilly Jane. The road was gated approximately three miles from its end. Uncertainty and indecision were rampant at the gate. Donnelly had issues about a ski streak. Somehow in his paradigm it was important that he ski before midnight. He was afraid he would be unable to do that hiking up the road, so he was voicing strong support to move the party to Timberline. Members of our group prone to recidivism wanted to obviate the debate about the gate. The one fact indelibly etched into my mind was that I did not drive all the way to Oregon, in June, to ski something from Timberline again. 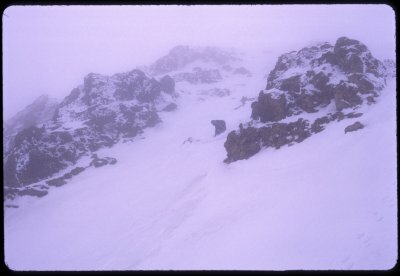 I consider Timberline a place for winter access. Somehow I was moved by abundant grovelling to loan Donnelly my car. Allen Greenspan couldn't have withstood Donnelly's irrational exuberance. The remainder of us decided to camp at the gate and make a dash at first light. Scott was thoroughly inebriated, but kind enough to share a plastic bottle of Jim Beam and prurient peccadilloes of a past paramour. Cyril was the first one awake in the morning. He was clearly in no mood to wait. I cursed Corey copiously, but he wouldn't rise. Cyril was soon gone. I was ready to go. Corey had just risen. I hastened after Cyril as Scott rolled over in his bag and inquired, "What the?" There was an easy trail that cut the switchbacks in the road. I took a photo of the view from the back deck of Cloudcap Inn. Cyril and I skinned through the trees, only to remove the skis to ascend the moraine. It wasn't too far up the moraine before we traversed toward the spur. There was a trickle from a snowfield between the moraine and the spur that let us drink our fill of the most delicious water. Once on the spur we were able to make good use of our skins. I had foolishly carried my skis in hand most of the way from the inn. The North Face looked great, but I thought we had started much too late to climb it. Cyril set a smoking pace; either that or I was sluggish. He waited for me over a knob, where the Cooper Spur route begins to roll concavely toward its steep upper pitch. We switched to crampons. Cyril charged up the face like a champion. Clouds floated up to us and visibility dropped as we climbed. 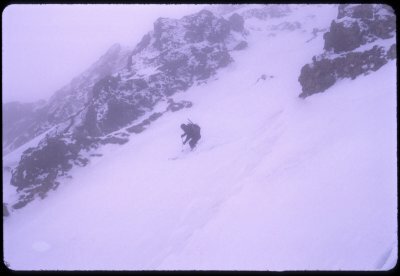 When we reached the steeps and rock bands visibility was low, but Cyril took a good path. I was actively placing my ice ax in snow that wasn't too secure. It would make for great skiing, though. Near the top we could hear some climbers from the south side express surprise when they saw us. The upper portion, where the fifty degree pitch eased to forty, featured a surprising amount of fresh snow. The summit greeted us with brisk winds from the south. Visibility seemed to be fading fast. We had considered skiing something even more adventurous, but decided to follow our tracks down Cooper Spur because of the white-out conditions. I took first turns in the deep, sticky fresh while Cyril finished his preparations. I waited for Cyril at the roll. 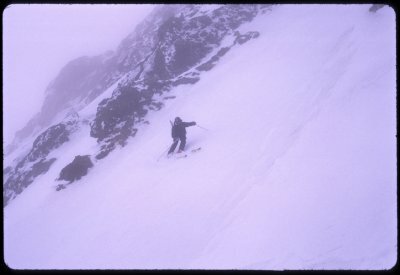 The snow was great for skiing steeps, but required caution where it could trickily alternate between fresh snow and the more consolidated base. Cyril's ascent route had climbed one particularly icy slope. I found an alternate descent by entering a short, narrow chute, which made for some really exhilirating turns. I stopped to take pictures of Cyril. I stuck to our tracks and soon we were east of the nasty exposure above the North Face and the Eliot Glacier. It's too bad the clouds robbed us of our fully view-enhanced stomach-in-throat sensation. 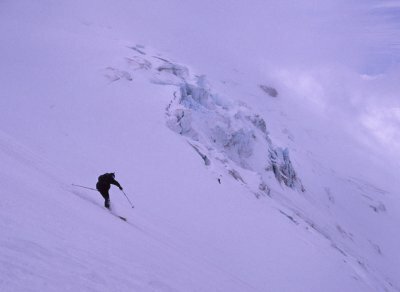 We skied all the way down the tongue of the Eliot Glacier for almost 6,000 continous vertical feet. We saw Corey and Scott's tracks descending from the Sunshine Route above the Snowdome. After only a few minutes we also saw Corey and Scott. A little more Jim Beam, some splinkage from Corey, an infinitesimal hike to the lodge, a few sprinkles on the way down to the car that made us feel good about jumping through the window, Donnelly in my car, and all was well in the world. I mused to the others how the only thing that could have made the trip better was pineapple juice along with some wicked hot springs. Cyril attended to all that, so things really couldn't have been better. Anything worth doing, is only worth doing because you're the right kind of crazy.